EMMANDUS INSPIRATIONAL NETWORK! : SUPER EAGLES' VICTORY: 160 MILLION REASONS TO BELIEVE IN NIGERIA ! SUPER EAGLES' VICTORY: 160 MILLION REASONS TO BELIEVE IN NIGERIA ! Warning? This post is mainly on sports *smiles* sorry I had to take a break from our recent thread to bring in this piece.Enjoy! I am writing and dedicating today’s post to Nigerian Super Eagles’ victory. I am sure you know by now that this isn’t a blog on sport, and asides that, writing on sports isn’t my strong point (Oops! Did I just spill a secret? )anyways I am not the regular sport analyst or a soccer 'fanatic', yet that doesn't mean I don’t’ enjoy watching a good game, especially when its a great match like when my favorite Manchester United FC slugged it out with Chelsea FC or Arsenal in the European League or most importantly when our country’s national team the Super Eagles of Nigeria mercilessly crushed Burkina Faso at the finals of the, African Cup of Nations,AFCON in South Africa, yesterday! 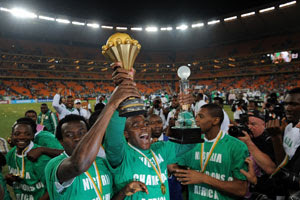 The AFCON which started a couple of weeks ago finally came to a glorious end yesterday. The high point of it all is that our own Nigerian Super Eagles won the Burkina Faso in the finals in a 1-0 victory. The Eagles’ journey in this competition had been a surprising one. Apart from the fact that I ‘watched’ all the matches (except the finals ) online- right from work (smiles),I never knew they could come up strong in the end, After the first match that ended in a draw, everyone’s hope in the team had shrunk totally and personally my expectation of the team wasn’t high after all. In fact I saw many Nigerians over the social media call them ‘super chickens’ amongst other names, all to show a form of disappointment in the team. What really rekindled this hope was when they won their match against Cote de Ivoire, in a 2-1 victory and got their ticket from the quarter finals to the semi finals, it was just like a twist of fate, and alas! almost everyone’s faith in the Eagles kept rising once again. And it was a great and momentous victory yesterday when they did just that and lived up to the expectations of Nigerians who believed, Nigeria could still make history again and win the trophy for the third time. I watched passionately yesterday alongside other viewer’s at the mesh, and with many patriotic Nigerian’s watching from different parts of the world, there was an uproar when the golden man of the match Sunday Mba, shot out like a bolt and made the winning goal in the first half, I tweeted in euphoria and also watched this same player occupy a ‘Worldwide Trend’ on twitter in that same hour! The Eagles played so hard and well the game was filled with great tension –remember, I am not a sport analyst here, and of course, I will not forget the great save by Vincent Enyeama when the Burkina did try their best so hard. Stephen Keshi-The Big Boss did a great Job! And I will not forget to recount how much he dazzled me with his nice command of de langue de Francais during the interview/briefing after the match. Different Fireworks from the ecstatic live crowd of Nigerians at the Soccer City in Johannesburg, South Africa and the gyrating crowd viewing the game from Teslim Balogun stadium in Lagos state all painted a joyful scene and the euphoria shared by all yesterday night, and like someone said ‘One good reason for Nigerians to be happy together’ i could also hear some ‘patriotic’ ones also demanding or expecting a public holiday.